One of the things that Tim and I were most looking forward to during our visit to Ketchikan was a flightseeing tour of Misty Fjords National Monument. Misty Fjords is an immense wilderness area just 22 miles east of Ketchikan and can only be visited by boat or plane. Since we had just spent six hours on the ferry the previous day, we decided that a floatplane tour was the way to go. Not only would we be able to grasp the immensity of the monument from the air, but we would be able to experience the sensation of landing and taking off from the water. I absolutely love floatplanes and opt for one whenever that choice is available. Misty Fjords was named for the almost-constant rainfall that is characteristic of the area, but it didn’t live up to its name for us. We flew on a mostly sunny day with nary a raindrop in site. It was a perfect day for flightseeing. Soon after departure, we were flying over the deep fjords and sheer granite walls that rise directly from the water. Thick forests of spruce, hemlock and cedar appeared as a green carpet from the air and provided a nice contrast to the snow-capped mountains. We spotted lacy waterfalls as they wound their way down the cliffs, fed by the streams and lakes that dotted the mountain tops. About half way through the tour, our plane began to descend, and we soon landed on one of those jewel-like lakes. At least for a bit, we were the only ones there in that incredible wilderness. We were able to step out of the plane and onto the pontoons and admire the beauty that surrounded us. That was a special moment. Too soon, however, it was time for another floatplane to take our place, but it was wonderful while it lasted. We flew over the lake one last time and began to make our way back to Ketchikan. We soon spotted Tongass Narrows, the waterway on which Ketchikan is located, and made a smooth landing back at the dock. The flight was over way too soon, but what a blast it was! Flightseeing is one of the most popular tourist activities in Ketchikan, and for a very good reason – it’s an amazing experience and one of the best ways to see the spectacular scenery of this area. Numerous companies offer tours to Misty Fjords, but we flew on Taquan Air, which seems to offer the most flights. I believe that five other planes took off at the same time we did. Some of the smaller companies may offer a more personalized tour, but we were very pleased with our experience. Why did we select Taquan Air? It was simple – this was the only outfit that offered a two-for-one deal. With tour prices around $269, that represented quite a savings. How did we get this deal? Before departing for Alaska, we purchased an Alaska TourSaver book that offers hundreds of coupons for tours, attractions and accommodations. We had checked out the offers beforehand and decided that we would recoup the $99 cost of the book with just one or two uses. We’re already ahead with the Misty Fjords tour, as well as the one free night offer we used at Clover Pass Resort. 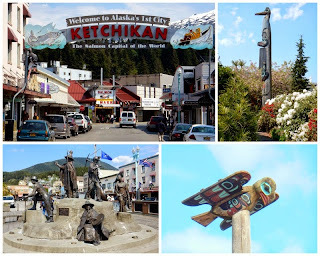 After our tour we made our way to downtown Ketchikan to see the town. Since it was Sunday, we were easily able to find parking on the street. We spent some time walking through the downtown area and tried to concentrate on the historic architecture, not the plethora of Caribbean jewelry stores that occupy the storefronts. Is this really what cruise ship passengers want to purchase in Alaska? My favorite area was Creek Street with its charming buildings constructed over the water. 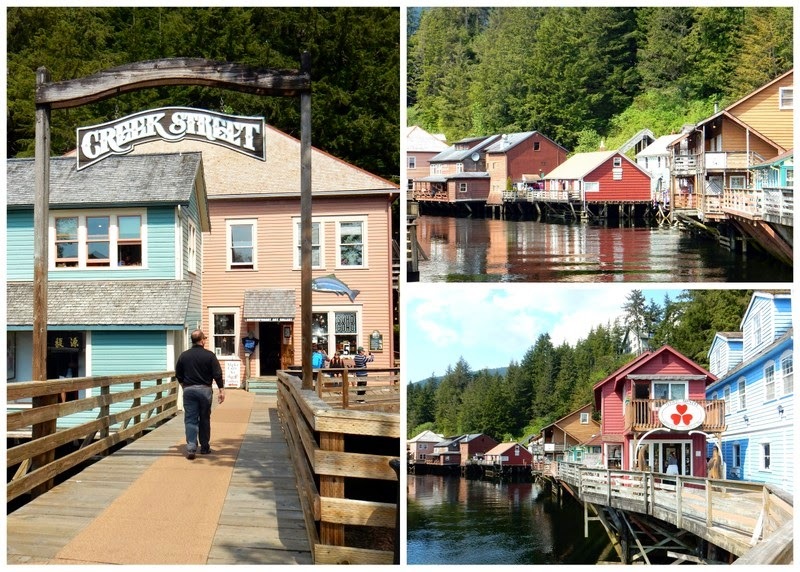 This former red-light district now houses shops and restaurants, as well as Dolly’s House, a museum dedicated to the life of Ketchikan’s most famous madam. At lunch, we learned that the crowds would increase four-fold on Tuesday, with five cruise ships due in port. More than 12,000 tourists would descend on the town of 8,000 residents. And we thought it was crowded with just three ships in town! With that bit of news, we decided to stay downtown and try to hit more of the sights that were on our list. The hordes of cruise ship passengers that descend en masse is the biggest negative for independent tourists visiting towns along Alaska’s Inside Passage (I'm sure a lot of the cruise ship passengers are not especially fond of it either). Thousands of people can overwhelm these small communities, and it is often hard to discover the true character of a town when you are fighting for a place on the sidewalk. However, if you simply walk just a few blocks away from the main activity center near the piers, it is often more peaceful. Even with three ships in port, we found streets to walk and places to visit where we encountered only a handful of other visitors. Spending several days in each port is another way to avoid the busiest days. 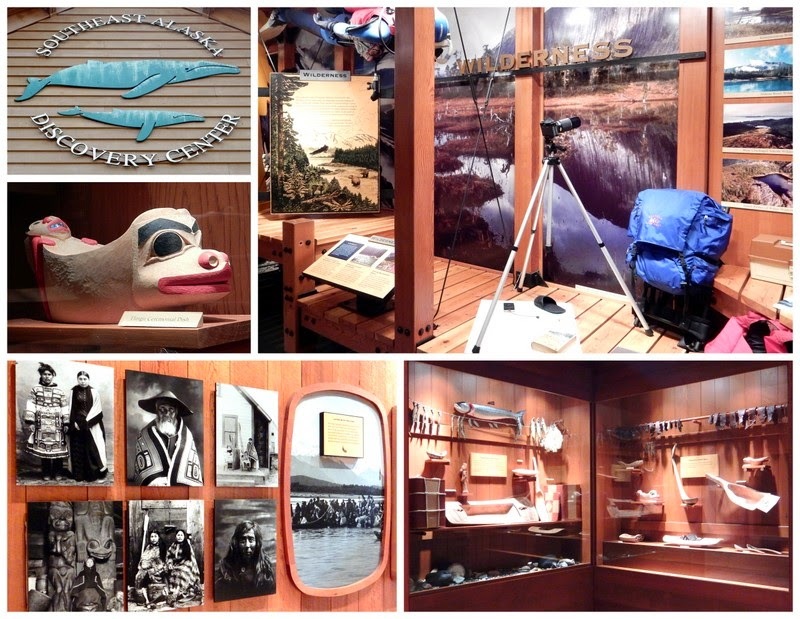 One such stop was the Southeast Alaska Discovery Center, an interpretive center operated by the U.S. Forest Service. We rested our legs a bit by watching one of the films, a very informative history of Ketchikan, and then toured the center. The exhibits focus on the land, people and culture of the Tongass National Forest, the largest national forest in the United States. We were impressed with the quality of the displays on the temperate rain forest, native traditions, ecosystems and natural resources. We next followed the very handy downtown walking tour that is mapped out in a brochure we had picked up at the visitor center. 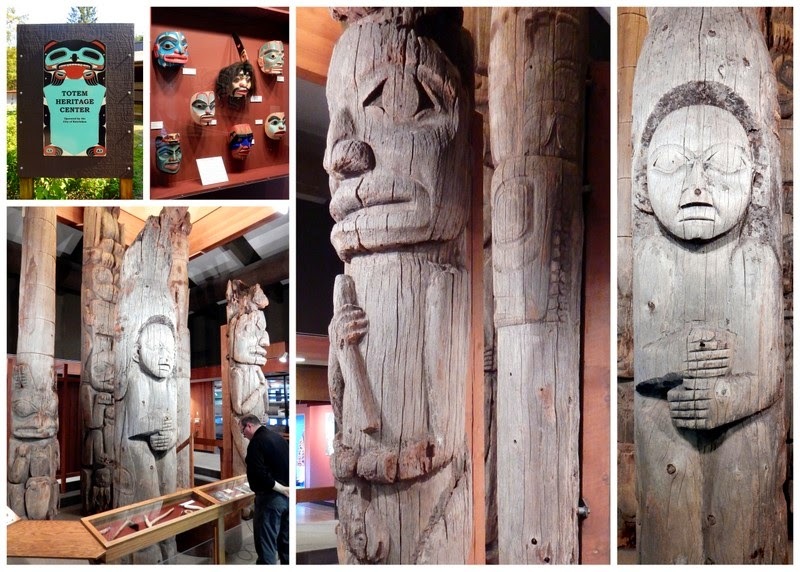 Our destination was the Totem Heritage Center, the world’s largest collection of nineteenth century totem poles. During our visit, only two other couples showed up. 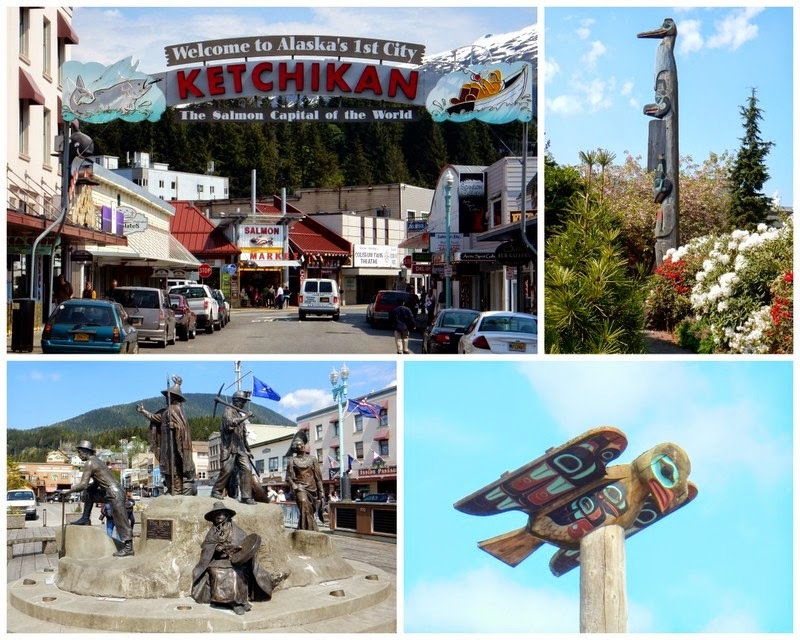 Ketchikan is known for its totem poles, and you can find them scattered throughout the city. All of these are new totems, or reproductions of original ones. What makes the Totem Heritage Center unique is that it preserves and displays historic totem poles in their unrestored condition. Totem poles are the most prominent symbol of cultural identity for the Northwest Coast Native peoples. These icons were carved to honor important individuals and to commemorate significant events. Carved from western red cedar, totem poles were designed to stand in place until they fell and were returned to the earth. And that is exactly what happened to most of them as Alaska Natives moved from their villages to seek employment in Ketchikan and other towns along the coast. Although some totem poles were sought out and salvaged by museums and collectors in the early twentieth century, it was not until the 1960s that a major effort was undertaken to survey and document those that remained. 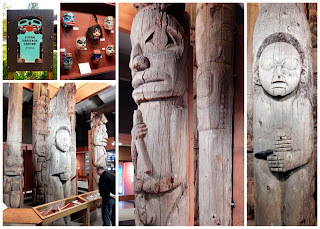 With the permission of Native elders, the Alaska State Museum and the Alaska Native Brotherhood then began to retrieve abandoned totem poles in the 1970s, and the City of Ketchikan provided the facility to house them. The stipulation was that the totems not be restored, but kept in the condition in which they were found. The City of Ketchikan operates the Totem Heritage Center, which is also dedicated to preserving the cultural traditions that gave rise to the totem poles on display. During the fall and winter, classes and workshops are taught in traditional arts and crafts in an effort to strengthen and perpetuate these traditions for future generations. An exhibit at the center showcases the works produced by the students. The quality of the objects makes me think that this artistic heritage is in good hands. Your post brought back wonderful memories of our first trip to AK - a cruisetour with Princess. Yes, we were one of those cruise ship pax ;-) We took a boat & flightseeing tour to Misty Fjords ... the flight portion was better as it gave us a real appreciation for the fjords; but if not for the boat portion, we would have missed a great encounter with a visiting pod of orcas. Everyone who plans to spend time in AK would benefit from the TourSaver Book ... we recouped our cost ... and more ... on the first use ... a nostalgic flightseeing trip in a DC10 out of Anchorage. Wow! A flightseeing trip in a DC10 sounds amazing. I'll have to see if it's still offered. Getting out on the water should be high on everyone's list of things to do in Alaska. We haven't spotted any whales yet, but hope to see some on the ferry or one of the other day cruises we have planned. I still remember the whale encounters from my first cruise in Alaska (yes, I was also one of those people). We were on a very small ship (less than 100 passengers), and the captain would notify us of any sightings. Several times that happened during dinner, and everyone got up and rushed to the deck. Good times for sure. Alas, the DC10 was discontinued a few years ago as the safety of the aircraft became an issue ... I only see heli flights offered by ERA now. Oh, that's too bad. I guess safety does outweigh everything else. Heli flights are also a fun way to go. Ketchikan is the place that made me fall in love with Alaska. Misty Fjords is what made us want to go to Alaska by boat. Still a dream not yet realized... Now I'm wondering why we didn't take the ferry like you are. Maybe next year, in a downsized rig. A B is perfect for that. Thank you for the beautiful pictures! You are welcome. It's been fun taking photographs, but not so fun culling through them and deciding which ones to post! Don't second guess yourself about not taking the ferry. You are seeing things that we will not have an opportunity to see, and there are advantages to both routes. However, I do like the idea of coming back next year and doing it the other way. Great recaps and pictures. We also have a sprinter. Question- do you typically turn off propane while en route to places and then how do you keep food cold. We are not full timers but take weekly trips and sometimes will drive 8-10 hrs in one day. Just curious. Thanks so much. I answered a similar question about propane on the last post. Here's what I said. There is a great debate among all RVers about the subject. To be very safe, propane should be shut off. However, many folks leave it on, and that's what we've been doing for years. We try to remember to turn it off while filling up at gas stations, however.